The story begins from the disappearance of Beast Tamer's frog, which result in a series of investigations which encounters Hayato and Kanna also looking for their missing tortoise, which later on encounters Zen looking for his white tiger and later on meet up with Jett the bounty hunter which is investigating on ARPOD the spacecraft. All 4 of them join forces and form a party 「Stellar Detectives」 working together to rescue their small missing pets. Eventually, they successfully located the APROD spaceship as they defeat the kidnappers and save their pets. After players complete the 「Stellar Detective」 quests. Lv33 to Lv250 players can freely enter the 「Hyperspace Box」 for 3 minutes which will receiving random challenges and the faster you clear the more points you can get and result in more rewards. The little Monster Kindergarteners are taking a field trip to Henesys for a picnic! You had better be there too, and try to protect Henesys and its NPCs from any damage the little creatures might cause. Look out for baby monsters like Crybaby Chronos and Baby Boulder Muncher! This event features multiple stages, and you must defend the NPCs and clear the monsters in each stage. The denizens of Henesys will reward you for your efforts with scrolls, 2x Coupons and more. And if you successfully defend the town multiple times, you can get your hands on a medal and chair! Join Mr. Lee as his World Tour returns! 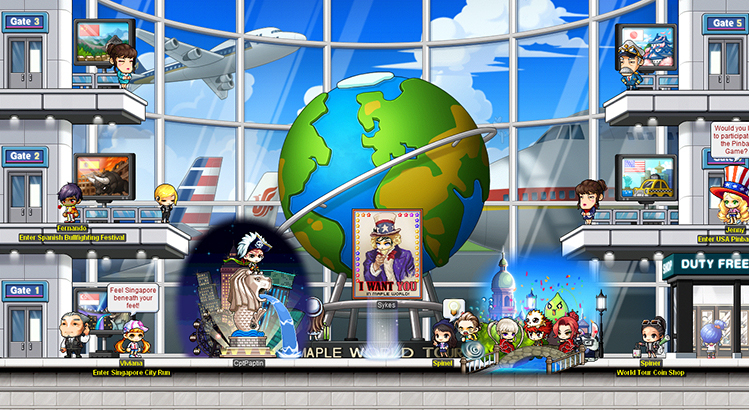 Travel to different countries and take part in mini-games. In the USA, you’ll become the pinball in a giant pinball machine. Visit Spain and survive the running of the bulls! In each country you’ll collect World Traveler Coins, which you can exchange for rewards from the coin shop, including special chairs, mounts and damage skins! If you clear all of the mini-games a set number of times, you can also earn the 2016 World Traveler medal!